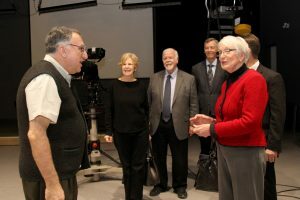 Members of The Church of Jesus Christ of Latter-day Saints recently met with Father Thomas Rosica at the Salt and Light Catholic Media Foundation headquarters in Toronto. 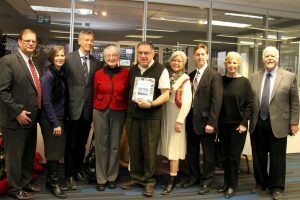 Members of The Church of Jesus Christ of Latter-day Saints recently met with Father Thomas Rosica at the Salt and Light Catholic Media Foundation headquarters in Toronto. Father Rosica is CEO of the foundation and a priest of the Congregation of St. Basil (Basilian Fathers). 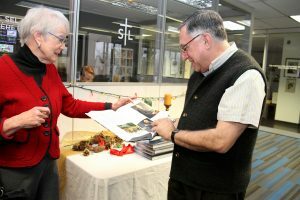 Kullervo Hynynen, the Toronto Ontario Stake president, presented Father Rosica with a copy of the recently published Canadian Mormons, in which Father Rosica’s relationship with the Church is highlighted. President Hynynen was joined by Bruce and Pearl Rae, the Ontario directors of public affairs for the Church; Pat and Hope Gani, the Toronto Ontario Stake directors of public affairs; Helen Warner, the Brampton Ontario Stake director of public affairs; Michèle Hynynen of Canada Mormon Newsroom and wife of President Hynynen; and Elder Lucky and Sister Tammy Morse, Church public affairs missionaries. 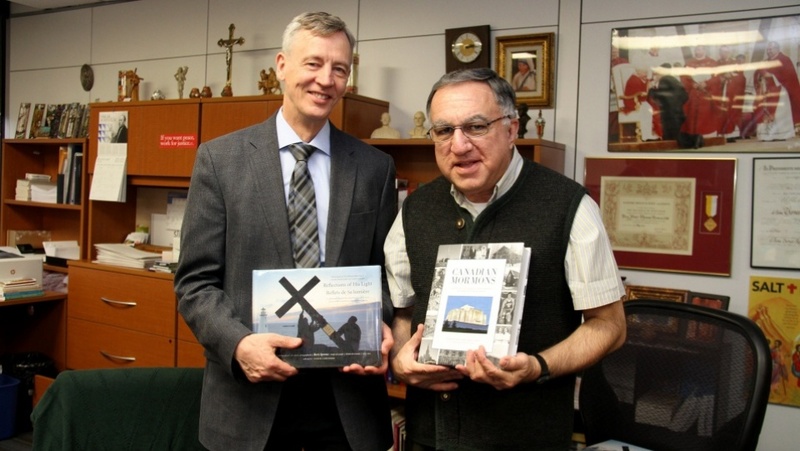 Father Rosica, in turn, presented President Hynynen with a copy of Reflections of His Light. The book depicts the 2002 World Youth Day held in Toronto, for which many Latter-day Saints volunteered. Father Rosica also led the public affairs group on a tour of Salt and Light’s studio and offices. The foundation produces faith-based programming for its Canadian multilingual television network, one of the leading 12 Catholic networks worldwide. 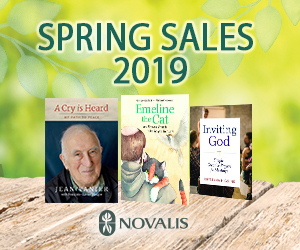 Father Rosica’s long-standing relationship with the Church in Toronto began when he met Elder V. Dallas Merrell, a former member of the Seventy, while on an airplane in 2001. When Elder Merrell and his wife later served as public affairs missionaries in Toronto, the friendship further developed. In 2002, Father Rosica was serving as the national director and CEO of World Youth Day, which was being held in Toronto and which Pope John Paul II attended. Elder Merrell arranged for 350 Latter-day Saint volunteers, many of them youth, to assist with various assignments for the event. It is because of Father Rosica’s great concern for youth that he was presented with a Family Values Award by local Church leaders in 2002. Then in 2011, Father Rosica was invited to lead the encore when the Mormon Tabernacle Choir performed at Toronto’s Roy Thomson Hall. He indicated he wanted to conduct to show his appreciation for the help Church members provided during the 2002 World Youth Day. A respect for the diverse beliefs and unique contributions of all the world’s faiths is one of the hallmarks of Mormonism. Latter-day Saints accept all sincere believers as equals in the pursuit of faith and in the great work of serving humanity. President Dieter F. Uchtdorf, former member of the First Presidency, declared: “We honor and respect sincere souls from all religions. ... We lift our voices in gratitude for their selflessness and courage. We embrace them as brothers and sisters, children of our Heavenly Father. … He grants light to those who seek and honor Him and are willing to obey His commandments” (“Faith of Our Fathers,” Apr. 2008 general conference).